With the launch of the iPhone 6s and 6s Plus, Apple introduced an iPhone Upgrade Program in the U.S. designed to let Apple customers pay a monthly installment fee for a new iPhone and trade it in after 12 months of payments to get the next-generation iPhone. When it debuted, the iPhone Upgrade Program required customers to purchase their iPhones within an Apple retail store to take advantage of the service, but as of today, the iPhone Upgrade Program is also available as an option when purchasing an iPhone from Apple's online store. 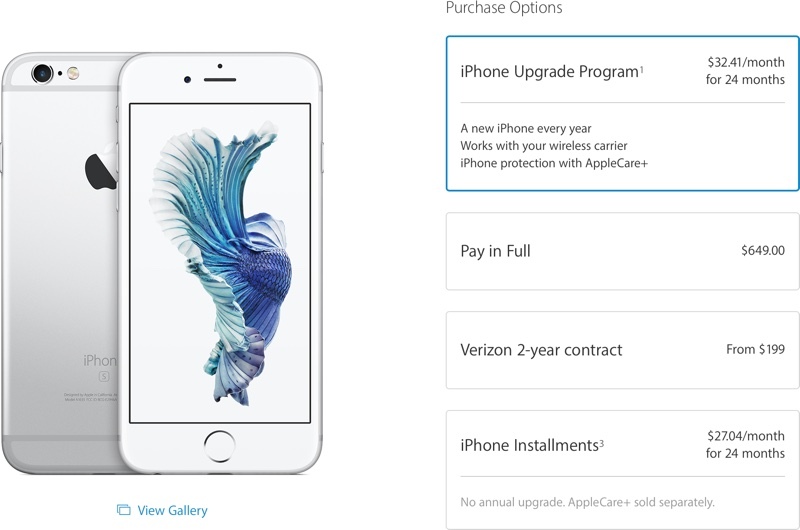 Apple's iPhone purchasing pages have been updated to reflect the change, with Apple's own pricing listed as a payment plan option instead of the carrier pricing options that were previously listed when purchasing an iPhone. With the iPhone Upgrade Program, installment pricing on the entry-level iPhone 6s begins at $32.41 per month while pricing on the larger-screened entry-level iPhone 6s Plus begins at $36.58 per month. Apple's iPhone Upgrade Program is unique compared to carrier installment plans because it includes AppleCare+ in the monthly price. The iPhone Upgrade Program is available for devices purchased with AT&T, Verizon, and Sprint service. American economics at its finest. You are a complete loser if you cannot afford to pay $649 + taxes up front for a smartphone. Sorry if you need to finance a smartphone then you really need to go back to school and learn how to count. This is how Americans get in debt. You buy something you cannot afford. Either pay for it in full or SAVE UP until you can afford it. These programs have ludicrous interest rates and their entire objective is to trap you paying interests because you miss payments/stop paying. There is no "free" service to the general public on helping you buy anything. I'm a bit confused. Apple's upgrade program has 0% interest and the payments happen automatically. What kind of trap do you think they are setting? What interest rate? A 64GB iPhone 6s+ is $850. Applecare+ is $129. That's a total of $979. 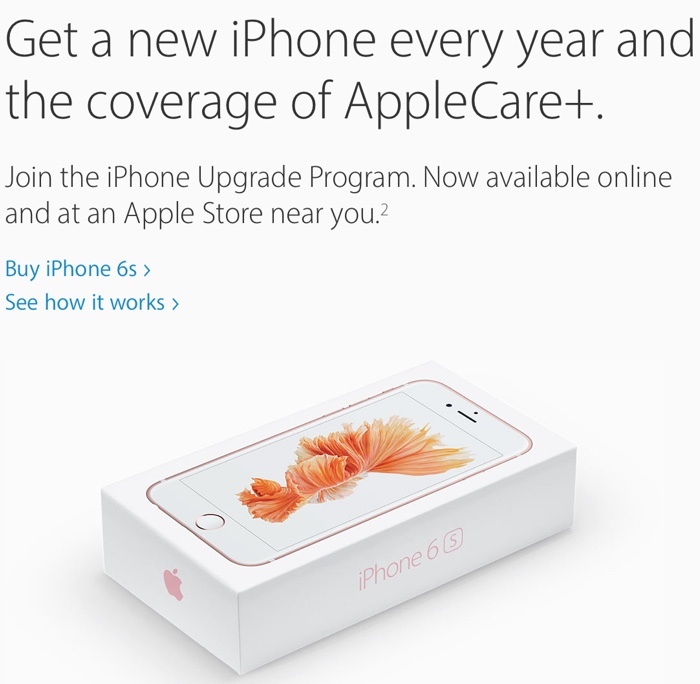 The iPhone upgrade plan for that phone is $40.75/mo over 24 months. $40.75 x 24 = $978. The interest rate is 0%. GO READ THE TERMS AND AGREEMENTS. * Credit Card Interest and other fees. You will be charged 0% APR on the Installment Loan. However, the issuer of your credit card may charge you interest or other fees under the terms and conditions in your cardmember agreement. This may include any applicable interest on unpaid balances or late payments. Your card issuer may not provide certain benefits in connection with loan payments charged to your card. Do you not understand how a credit card works? You don't pay interest if you pay your bill on time in full. My credit cards actually pay me to use them with cashback. Everyone should read the fine print. Those that cannot read obviously are the ones who believe love to finance cellphones. Stop financing a cellphone so you can look cool. Either pay for it in full or save your money. Learn how to save up and not use financing for stupid stuff like cellphones. This is the biggest issue with american's who cannot afford to buy stuff but yet want to do it thru financing programs. I am really hoping this becomes available in the UK by the time the iPhone 7 is released. There's no interest to pay using this plan. And to call someone a "loser" based on their financial situation is distasteful and completely unnecessary. You guys don't read the terms. It's not about whether or not you have great credit to qualify for the 0% APR in the first place, it's the fact that these programs are to get people who can't even pay their bills on time to suffer even more. The loan installment is thru your credit card. Good, let the people who can't pay their bill suffer. Their interest pays for my cashback. I pay my bills on time and benefit for it. Why wouldn't I take advantage of a 0% APR loan on a phone if it exists? Wrong, bro. This program has 0 interest rate. American economics at its finest. You are a complete (the term "loser" was suggested as being too rude but I can't help the fact if you can't afford something to begin with and yet you still want something you cannot afford AND you refuse to buy something in your own budget range, then you are pretty much a "loser" in my book). If you cannot afford to pay $649 + taxes up front for a smartphone. Sorry if you need to finance a smartphone then you really need to go back to school and learn how to count. This is how Americans get in debt. You buy something you cannot afford. OR just buy something within your budget.